Sorte, Eric G., Benjamin A. Paren, Christina G. Rodriguez, Cy Fujimoto, Cassandria Poirier, Lauren J. Abbott, Nathaniel A. Lynd, Karen I. Winey, Amalie L. Frischknecht, and Todd M. Alam. 2019. “Impact of Hydration and Sulfonation on the Morphology and Ionic Conductivity of Sulfonated Poly(Phenylene) Proton Exchange Membranes.” Macromolecules, January. https://doi.org/10.1021/acs.macromol.8b02013. Krook, Nadia M., Jamie Ford, Manuel Maréchal, Patrice Rannou, Jeffrey S. Meth, Christopher B. Murray, and Russell J. Composto. 2018. “Alignment of Nanoplates in Lamellar Diblock Copolymer Domains and the Effect of Particle Volume Fraction on Phase Behavior.” ACS Macro Letters, November. https://doi.org/10.1021/acsmacrolett.8b00665. Middleton, L. Robert, Edward B. Trigg, Lu Yan, and Karen I. Winey. 2018. “Deformation-Induced Morphology Evolution of Precise Polyethylene Ionomers.” Polymer 144 (May): 184–91. https://doi.org/10.1016/j.polymer.2018.04.049. Trigg, Edward B. 2018. “Controlled Folding in Precisely Functionalized Polyethylenes: Designing Nanoscale Lamellar Structures for Ion Transport.” Ph.D., United States — Pennsylvania: University of Pennsylvania. Trigg, Edward B., Taylor W. Gaines, Manuel Maréchal, Demi E. Moed, Patrice Rannou, Kenneth B. Wagener, Mark J. Stevens, and Karen I. Winey. 2018. “Self-Assembled Highly Ordered Acid Layers in Precisely Sulfonated Polyethylene Produce Efficient Proton Transport.” Nature Materials, May, 1. https://doi.org/10.1038/s41563-018-0097-2. Glor, Ethan C., Robert C. Ferrier, Chen Li, Russell J. Composto, and Zahra Fakhraai. 2017. 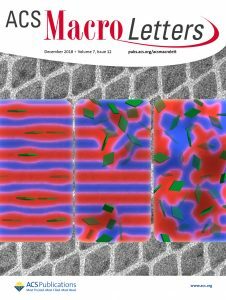 “Out-of-Plane Orientation Alignment and Reorientation Dynamics of Gold Nanorods in Polymer Nanocomposite Films.” Soft Matter 13 (11): 2207–15. https://doi.org/10.1039/C6SM02403C. Koski, Jason P., Robert C. Ferrier, Nadia M. Krook, Huikuan Chao, Russell J. Composto, Amalie L. Frischknecht, and Robert A. Riggleman. 2017. “Comparison of Field-Theoretic Approaches in Predicting Polymer Nanocomposite Phase Behavior.” Macromolecules 50 (21): 8797–8809. https://doi.org/10.1021/acs.macromol.7b01731. Trigg, Edward B., L. Robert Middleton, Demi E. Moed, and Karen I. Winey. 2017. “Transverse Orientation of Acid Layers in the Crystallites of a Precise Polymer.” Macromolecules 50 (22): 8988–95. https://doi.org/10.1021/acs.macromol.7b02094. Trigg, Edward B., Mark J. Stevens, and Karen I. Winey. 2017. “Chain Folding Produces a Multilayered Morphology in a Precise Polymer: Simulations and Experiments.” Journal of the American Chemical Society 139 (10): 3747–55. https://doi.org/10.1021/jacs.6b12817. Trigg, Edward B., Brandon J. Tiegs, Geoffrey W. Coates, and Karen I. Winey. 2017. “High Morphological Order in a Nearly Precise Acid-Containing Polymer and Ionomer.” ACS Macro Letters 6 (9): 947–51. https://doi.org/10.1021/acsmacrolett.7b00450. Wu, Yaoting, Siming Li, Natalie Gogotsi, Tianshuo Zhao, Blaise Fleury, Cherie R. Kagan, Christopher B. Murray, and Jason B. Baxter. 2017. “Directional Carrier Transfer in Strongly Coupled Binary Nanocrystal Superlattice Films Formed by Assembly and in Situ Ligand Exchange at a Liquid–Air Interface.” The Journal of Physical Chemistry C 121 (8): 4146–57. https://doi.org/10.1021/acs.jpcc.6b12327.